This vibrant composition by the Newar artists Raj Prakash Tuladhar and Ram Prakash Shrestha depicts the elephant-headed deity, Ganesh or Ganapati, in his white two-armed aspect. His three-eyed face gazes towards the right, his forehead is marked with the three vermilion lines and lower crescent of a Shaivite tripundra, and his one visible tusk and trunk are decorated with vermilion patterns and lines. He wears a jewel-studded golden crown adorned with victory flags, with small golden earrings piercing his large convoluted earlobes. His powerful pot-bellied body is adorned with an ornate golden neck-choker, a long necklace, a belt, armlets and anklets, and bracelets that are adorned with coiled naga-serpents. A long billowing green silk scarf coils around his upper body and arms, and as lower garments he wears sumptuously embroidered robes of red and blue silks. The stem of a pink lotus in entwined around his raised trunk, and with his right and left hands he holds a white radish (Skt. meuli) with its leaves, and a laddu, which respectively are Ganesha’s favourite vegetable and sweet. With his left leg raised he dances upon the silver-blue moon disc of a pink lotus pedestal, with his diminutive shrew or mouse vehicle seated near his right foot and holding a pearl or jewel in its tiny paw. 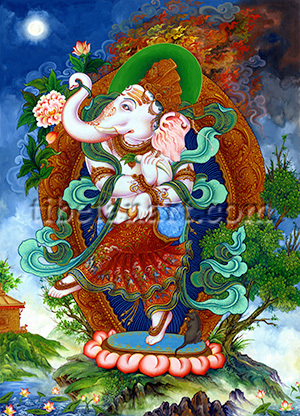 Ganesh’s ornate golden aura is encircled by foliage, flowers, flames and smoke, while the full-moon shines in the night sky above him. The misty lower landscape of rock formations and a Newar shrine appearing above a lotus lake are a characteristic signature of Raj Prakash’s unique and vividly colourful style.